Join us for an evening of discussion, performance, and camaraderie! Hudson Pride Center’s Community Coordinator Josh Bell hosts a conversation about life on the cusp among ‘In The In Between’ artists and HPC Client Services Counselor Max Laffend. Free. Variety show mixing live music, modern dance, and poetry by queer-identifying artists. Featuring MAPS OF (music), Madison Negron (poetry), Dot Armstrong, and more. $10 at the door. Hang out with the artists, speakers, and community <3 Snacks and drinks on offer; cash contributions appreciated. On view March 29 - April 21 at gallery hours Sat & Sun 12-4p, in conjunction with gallery events, and by appointment. Cherry Chen presents Color of the Snow, a premiere of mixed media performance about dreams, growth, and love. Chen's original compositions weave Taiwanese, Mandarin, and English into an evening of performance by Cherry Chen (vibraphone/voice) and Geo Progulakis (piano), with visual art by Wei-en Yang. SMUSH Gallery’s Frothy, Cake-Smushing First Birthday Party! Early bird tickets (starting at $20!) available through Jan 31! Home Space is a group show exploring the worlds we build for ourselves. 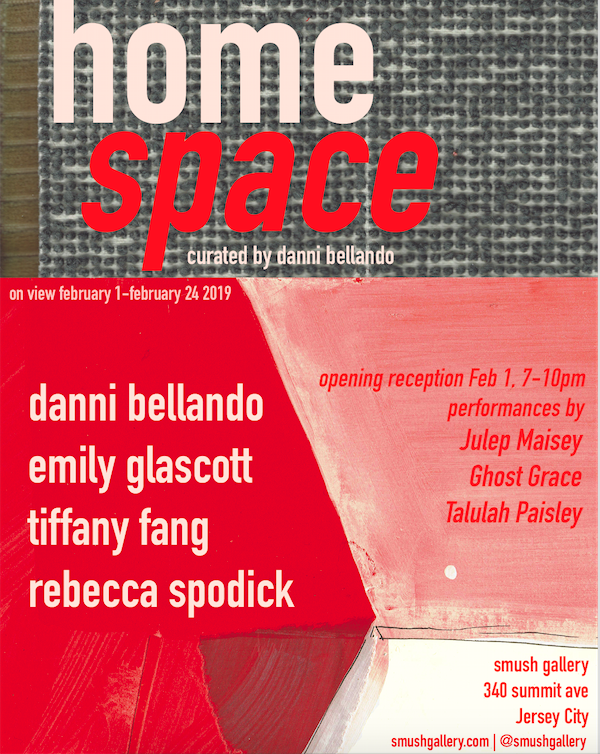 Through the use of color, material, and different representations of space, Home Space delves into our personal comforts, intimacies and vulnerabilities. Featuring work by Danni Bellando, Emily Glascott, Tiffany Fang and Rebecca Spodick. Curated by Danni Bellando. On view through February 24. Opening reception features live music by Julep Maisey, Ghost Grace, and Talulah Paisley. Music, comedy, dance, and hot dogs in a can't-believe-it's-not-summer setting. All proceeds support our Subsidized Summer Arts Residency fundraiser, aiming to give artists free space to make work! Performances by Madison Negron, Molly McGrath, Brittany Brave, Corinne Shearer, Chill Brown, Alex Pergament & Ariel Guidry, and more. Co-hosted by Stacy Collado and Molly McGrath. Featuring work by Emma Bjornsen, Yogee Chandrasekaran, Fred Fleisher, Hailey Dugan, John Erbach, Kerry Kolenut, Brittany Maldonado, Charlotte Marino, Deirdre Newman, Sanika Phawde, Joy Alicia Raines, Joe Remmert, Brad Terhune, Emily Walek, and Randi Wolfman, curated by Katelyn Halpern. Join us for family-focused Open Studio days! Families with kids of all ages are invited to drop in, get creative, and make their own art inspired by the current exhibition! Materials and guidance are provided. $5 per participant. Children may not be left unattended during Open Studio. 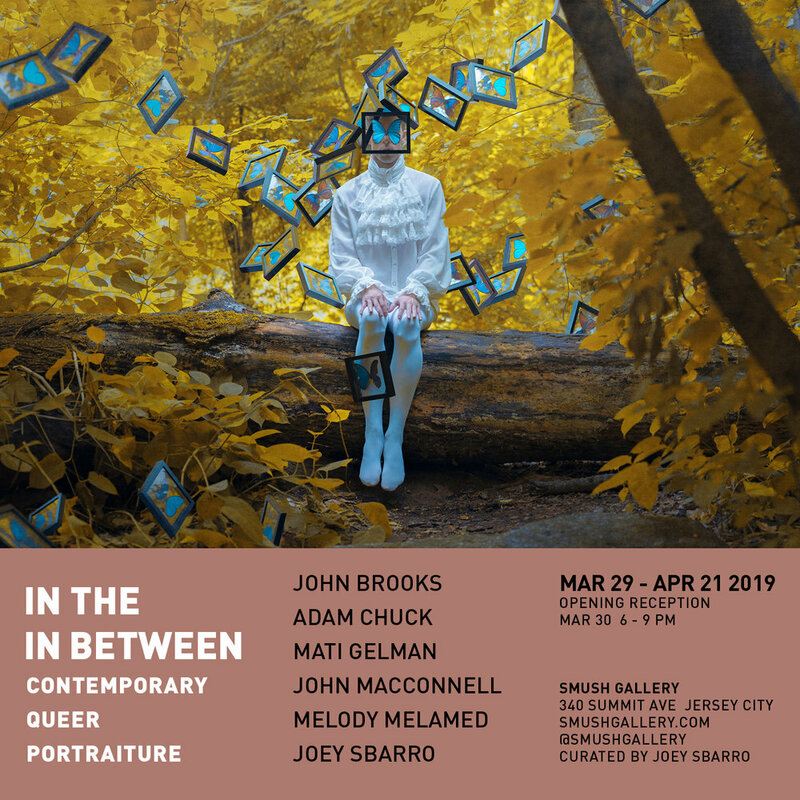 Featuring work by Emma Bjornsen, Yogee Chandrasekaran, Fred Fleisher, Hailey Dugan, John Erbach, Kerry Kolenut, Brittany Maldonado, Charlotte Marino, Deirdre Newman, Sanika Phawde, Joy Alicia Raines, Joe Remmert, Brad Terhune, Emily Walek, and Randi Wolfman. Families with kids of all ages are invited to drop in, get creative, and make their own art inspired by the current exhibition! Materials and guidance are provided. $10 per participant. Children may not be left unattended during Open Studio. Midterms are Coming: Vote For Freedom! In the week prior to midterm elections, SMUSH Gallery invites our community to share their hopes, demands, and dreams in partnership with the For Freedoms Lawn Sign project. Completed lawn signs will be displayed in our street facing window as encouragement for all our neighbors to engage with our elections and get out the vote. Discover the shades of cochineal with a handmade natural dye workshop with local artist Talita Cabral. During the workshop, participants will have the opportunity to experience cochineal hands-on in an open artisanal environment, experiment with basic methods, and create works of their own. The project for October 19 is a scarf, and for October 21, a tote bag. Open to adults and teens 15+. No experience necessary. All materials included. Workshops are offered on a sliding scale from $35-65; please select the price that best suits your budget. RSVP by Tuesday, October 16; email hello@smushgallery.com to reserve your spot! Masters of ceremony Sam Pullin and Noah Tavlin cordially invite you to attend Rat Ball 2018, an evening of rat jazz, rat revelry, ratfle prizes, and a rattiest rat award. Slip into your comfort zone amongst installation, artwork, and design curated just for rats. Also presenting: The Vermin Jazz Trio featuring king rat David Zaks. Read more about our artists & their residency projects! On view 24/7 in our storefront window. eSKay Arts Collective-established in 2016 by Shannon Reynolds and Kelly Flansburg, eSKay Arts Collective has grown into a collaboration of artists who are able to grow their ideas through sharing resources and engaging the talents and support of fellow artists in the collective. 'TRANSLOCATE' is a two day performance installation by collaborative artists Ross Daniel and Sarah Rose (DanielRose Projects) showcasing immersive visual art and dance material developed at different sites around the greater NYC area. The gallery will be open to the public across two days as the artists shape their material to the space. The artists will give a formal presentation of material the evening of July 10. The opening reception features a performance by Jersey City's premiere a capella do wop group, The Prom Dates! The closing reception features Prince covers by The Beautiful Ones. Performances at 7:30p. SMUSH Gallery is open by appointment and in conjunction with other gallery events. Please see our upcoming events or email hello@smushgallery.com to make an appointment. Free RSVP though June 13! Open mic slots are 3 minutes each, first come, first served. Hosted by Marcus Emel. Come through! 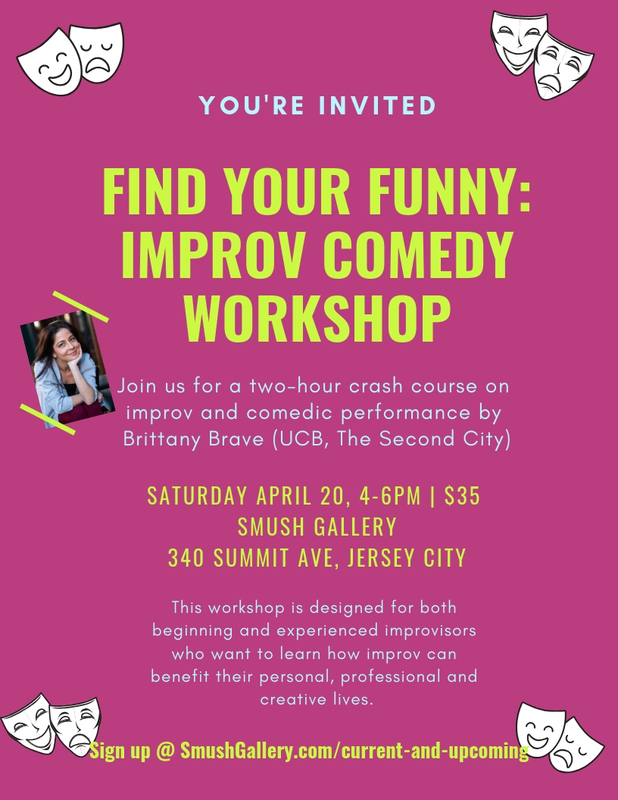 Experience SMUSH Gallery’s high energy group show featuring more than a dozen visual and text based artists from Jersey City, New York, and beyond. All work priced at sixty dollars max. 'Blanc & Bonk' is a suite of catchy tunes and memorable dances performed by stb x at. Featuring socially and historically important compositions and choreography, the curated medley chronicles dance-and-music collaborations through the ages... shown slightly off-kilter. Extracting moments from classical ballets to modern-day music videos, stb x at has reduced entire orchestrations to a solo vibraphone and transposed prima ballerina gestures onto a dragged-up try-hard. stb x at is Sean Thomas Boyt and Dr. Andy Thierauf. Free RSVP though May 13! Hear a discussion about running for office in Jersey City from the candidates themselves. Our panel will be made up of a group of candidates who ran in 2017 but lost. The conversation will be candid, non-partisan, and focused on the day-to-day realities of being a candidate. The event will also be an opportunity to say "Thanks" to those who threw their hat into the ring and an opportunity to educate the next generation of voters, volunteers, and candidates. This is a free educational event for anyone interested in running for office and for those who want to learn more about our democratic process. Light refreshments will be served. 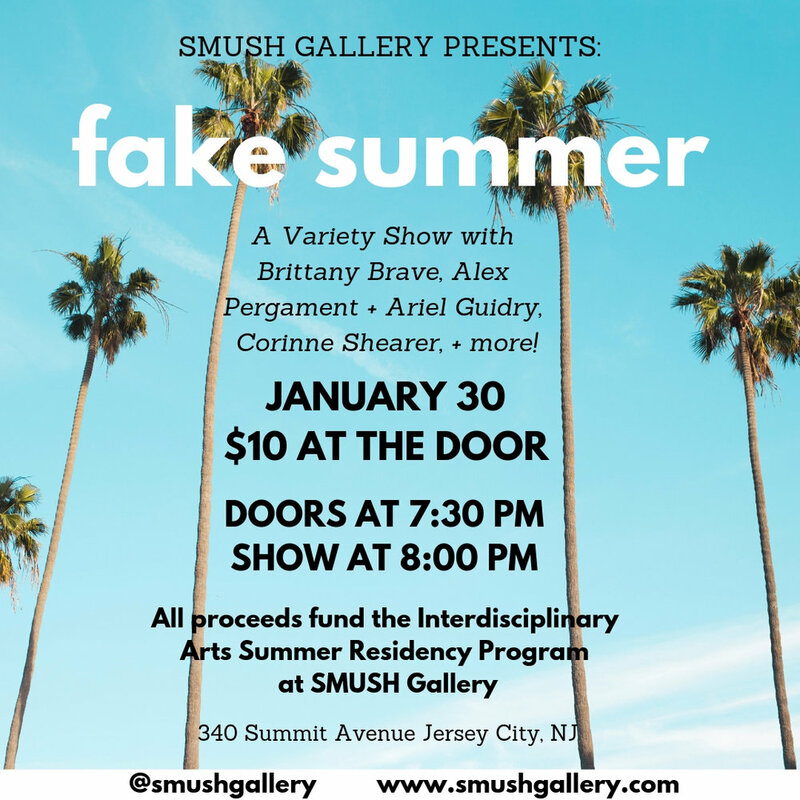 Celebrate SMUSH's first live music event! Sets by Marmalakes, Taft, Matt Puckett, Marcus Brown, and Ofer Shoval. After the harsh winds, snows, and gray skies of the previous season, join us as we take in the color and form of luscious spring blooms. Come follow the Spring, beautifully presented by the diverse work of the artists showcased in this exhibit: Beth Lucas, Deirdre Kennedy, Shilpa Gowda, and Marlene Sandekamp, curated by Maria Ross. Open to all levels (beginner to professional). Focus & Intention on body awareness, alignment, stretch & mindful physical practice. Fun phrase work and explorative approach! Open mic slots are 3 minutes each, first come, first served. Presented with Marcus Emel Brand, LLC. Come through! 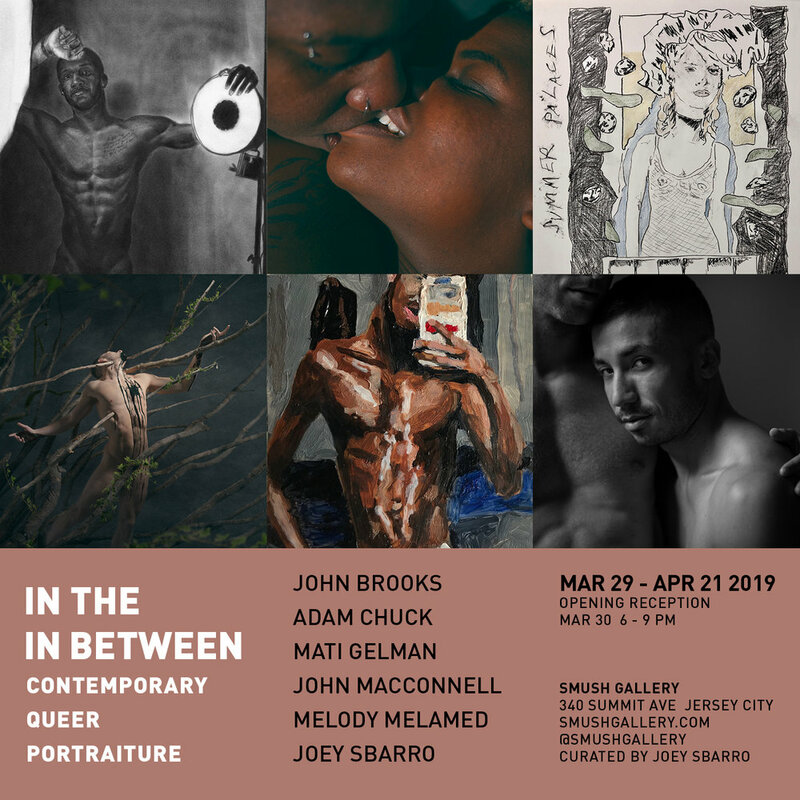 Join us for up-close-and-personal dance and performance from Jersey City and beyond, with work from Parijat Desai, kamrDANCE, Meagan Woods & Co., Myssi Robinson, mignolo, Sebastian Abarbanell, Olivia Greco, and Ross Daniel. Meet your next collaborator, spread the word about your latest project, and find new ways to get involved in your community. Enjoy light refreshments, homegrown art, and jump into a collaborative art project. Don't forget - bring your friends! Artists wishing to sell work or give a short performance - please email Katelyn at hello@smushgallery.com. Join SMUSH Gallery for an up close and personal evening of dance and performance. Artists from Jersey City and beyond share their work at one of Jersey City’s newest art spaces. Seating is limited - arrive early! Featuring Maria Bonacci, Paris Crayton III, Aliah Rosenthal, Sergio G. Satelite. Open mic slots are 3 minutes each, first come, first served. Presented with Marcus Emel Brand, LLC. Come through!